David Duncan, founder of Needham Duncan Architecture LLC, has over thirty years experience in residential, commercial and institutional architecture. He is a registered architect who received his undergraduate degree with honors in art history from Trinity College in Hartford, CT in 1979 and his Masters Degree in Architecture from Harvard University in 1983. For eight years, David practiced in Washington, D.C. with two nationally-renowned architectural firms. During this time, he was exposed to some of the most restrictive zoning and historic requirements in the country, having to overcome and work creatively within the confines of these regulatory guidelines. 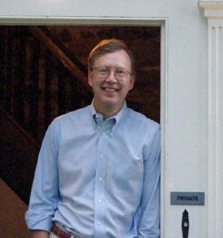 He founded Needham Duncan Architecture in Connecticut in September of 1991, and is also licensed in the state of New York. In addition to his client work, he has been very involved in his communities, assisting groups such as Habitat for Humanity, regional economic development agencies, local building committees and historic districts in an advisory capacity, the Town of Madison, Advisory Committee on Architectural Appearance, the Lyme Art Association and the Children's Museum of Southeastern Connecticut. Commendation from Connecticut State Senator Ed Meyer, Vice Chair of the Environment Committee, for working with him on geothermal energy concerns. 800 North Capitol Street, Washington, D.C.